To me it was such an achievement to have completed my first Marathon. Looking back (as I engage in being active again in my fitness activities), there were times that I struggled in every event that I took such as my first Mountain Bike Trail, my first 10km and my first half marathon. Struggled in the sense that I have felt so stressed out that I “hit the wall”, gasped for air, and the numerous knee and leg pains after each event. I knew that as a beginner, I was bound to experience those pains since my body needed to adjust to the level of physical activities that I am getting into. Plus of course the lack of understanding on how to prepare for such event. As I learn new things in every event that I joined, I had my own share on the pie of those athletes who gets injured due to improper training, and running too fast too soon, and among other things. Preparation and proper training is key in every event. Especially in joining a full marathon, it is important that you gain enough mileage and follow a sound training plan to help you finish your goal. However in some cases, there are certain constraints (injury, illness, time to train, weather, lack of motivation, etc..) that hinders you from following your training plan to the letter. Most of the time people would just stop and forego their plans to proceed on what they intended to do in the first place. But how can you overcome these constraints and maintain focus in achieving your goal? Here are some thoughts that helped me overcome my own problems prior to my first Marathon. 1. Defining your goals – This sets the foundation on why you want to train. It allows you to focus and get back to this goal whenever you are doubting yourself in your preparation. You must not only set a date on your first marathon but also come up with an objective on why you want to finish one. This will remind you later on during your run and will keep you motivated to complete your task. 2. Have your injury checked – one way or another you will end up getting an injury during your training probably due to lack of discipline or simply an accident. This will definitely stop you or slow you down in your training. I have been nursing my injury for almost two months prior to my first marathon, and as I mentioned in my other blog, I went to see a doctor specializing in sports medicine to get his professional opinion and to be guided on what to do for it to completely heal and recuperate. It is important that you attend to your injury for fast recovery. I underwent a physical therapy. 3. Cross training – if you can’t run due to an injury, do cross training on bike or swimming to keep you in good shape. In my case I did a bike cross train and rode an equivalent distance of my planned run. For every 1km of run, I was doing 3.5km of bike. Staying fit to improve endurance despite of an injury will help you finish that extra mile. 4. Mental preparation – it is equally important to prepare mentally for a marathon. With the injury, you would definitely lose a lot of running mileage which might lead you to think that you are not ready to conquer a full marathon. In my case, I had an on and off runs and my longest run was 21km. I have not reached a 1,000 km mileage and was really in doubt whether I can finish a full marathon. Based on what I read from magazines, blogs, and even experience of other runners, it is important to build mileage to help improve your foundation in long runs. With all this affecting your confidence, the arsenal that you can use is your mental ability to overcome all the obstructions that you had during your training. At the end of the day, mental focus is all that will matter. 5. Maintain focus in your objective – during my marathon, I only had one thing in my mind, to finish my first marathon without any injury. I accepted the fact that conquering it would be difficult and that I have to work hard for it and feel the pain if I really want to meet my objective. I have thought of all the reasons why I am doing it and that was all that matter to me. Even my doubts were all out, I did not bring it with me and made sure that it will not slow me down. I maintained my focus and it was effective. 6. Do not entertain negative thoughts - never entertain any negative thoughts during your run. 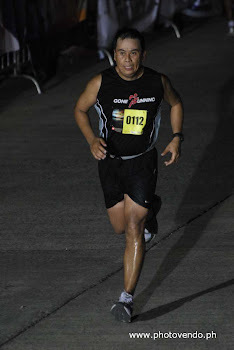 For the whole week prior to the run, I stopped worrying about the lack of mileage and my injury. The moment you accept negative thoughts such as feeling the pain, or doubting if you can finish, and worry about any discomfort while you are running, you will lose the grip and would end up up quitting. So stay positive and BELIEVE that you can do it..
7. Enjoy the run – Simply enjoy and have fun. Meet new friends and enjoy the scenery and the environment.. You will be amazed that you will not even notice that you are almost near the finish line. These are some of the key inputs that helped me finish my first marathon. There are a lot of experiences from other runners and I think some of you will agree to this. For non-runners, you may learn from this and apply to your daily life. It can be from your work, family, or anything that you are busy with right now. Set your goals, prepare, and believe that you can do it. It works!